The 1992 song, They Reminisce Over You, by Pete Rock & C.L. Smooth is a hip-hop staple. Many critics consider it to be one of the best produced hip-hop songs ever. It transcends time, bringing the listener back to a certain time and place. When I think about Original Jones Bags, Reminisce immediately pops into my head. Jones bags were the de facto walking bags in the 70s, 80s and early 90s. 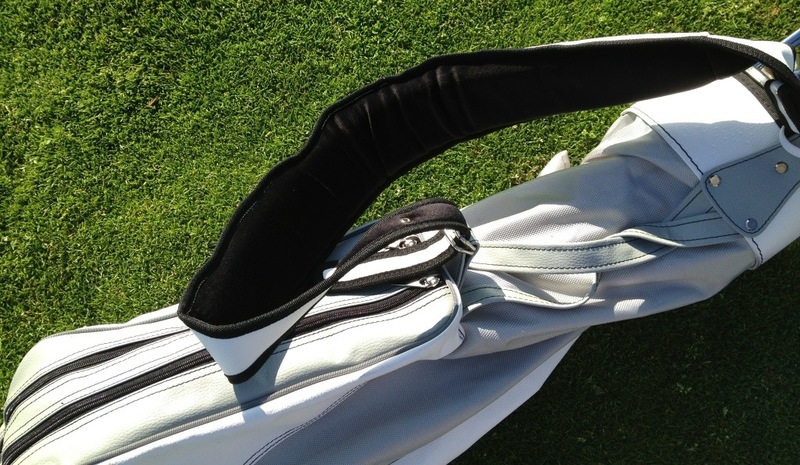 Many golfers considered them to be the best walking bags of their era. When I first heard Jones Bags were being resurrected, I was immediately brought back in time. In fact, (as the lyrics from Reminisce suggest) I think it was about 22 years ago that I last threw a Jones Bag over my shoulder (backwards) and chased the little white ball down the fairway. 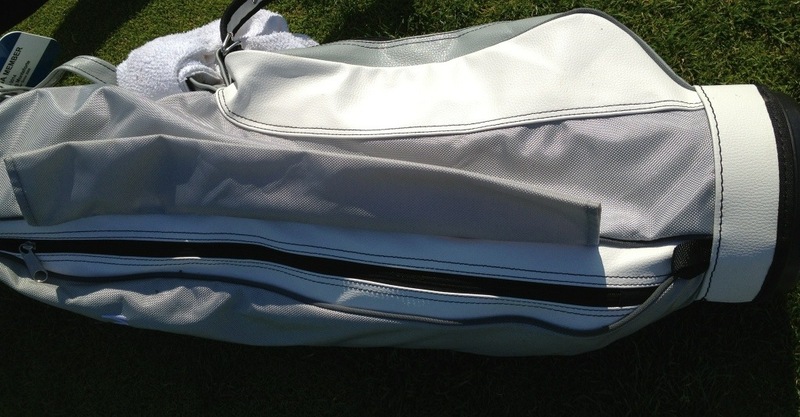 If you were a junior or college golfer during this era, you probably had a Jones Bag, too, and the side of the bag likely featured your name or the name of your school or club. 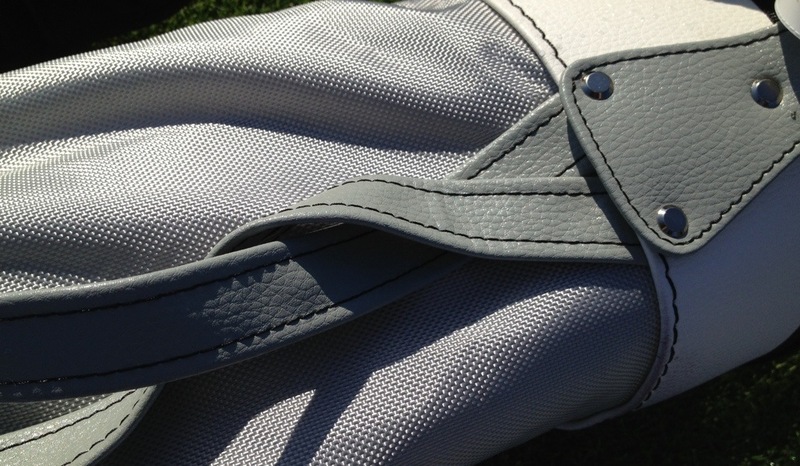 Having one of these customizations on your Jones Bag was a necessity. 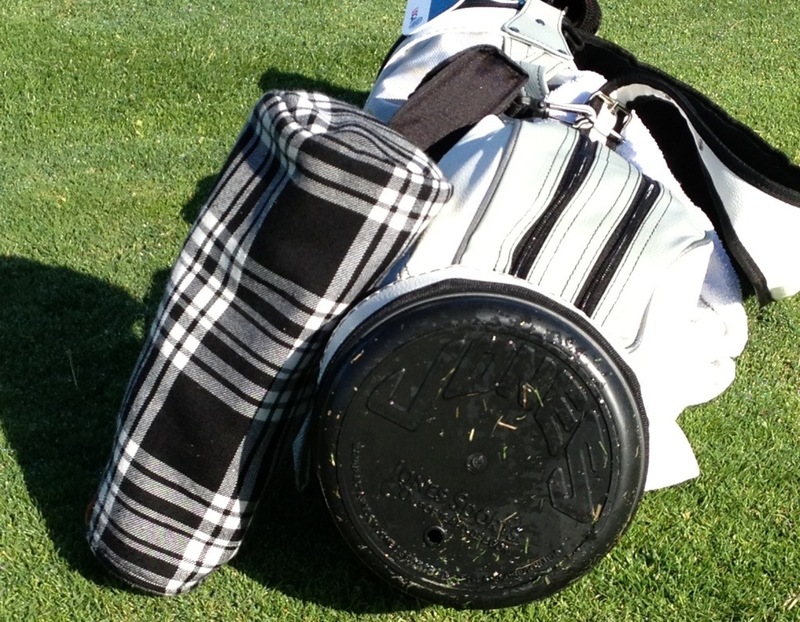 It was one of the only ways you could identify your bag in the sea of other Jones Bags around practice greens at tournaments. Jones Bags have risen from the ashes thanks to Dean Lemman and his family who rebuilt the bags and relaunched the Jones Sports Co. brand last year. Maybe the resurrection was brought on by the whole retro movement or maybe it is a testament to good ideas don’t die, they just get better. One thing is for sure, the Lemmans did a great job of recreating the Jones Bags with the simple, classic look that I remember. The wide single strap, no stand, three pockets, and twisted handle were all signatures of the Jones bags and they have been restored with the new version. I have to admit, even though the return of the Original Jones Bags captured my attention, I was hesitant to get one until recently. Three pockets hardly seemed liked enough room for the tools of the modern game. Where would my rangefinder live? What about my cell phone? My water bottle? Would my grips get wet from laying the bag on the ground? Plus, my current stand bag still had both legs attached, no holes in the pockets and served me well. When I did take the plunge on the Original Jones Bag it is was purely for sentimental reasons. I thought it would make a nice home for the stash of clubs in the garage. You know, the putters that no longer make putts, the drivers that no longer find fairways and the wedges that no longer have grooves. All the while it would serve as a gentle reminder of my early years on the course. As soon as I opened the box and saw the bag, though, I knew it needed to make a trip to the course. As I started packing my new Original Jones Bag for its first round, the genius of the design became apparent. I’ve always considered myself to be a minimalist, but the dozen balls, eight gloves, six sharpies, five ball mark repair tools, three packs of hand warmers and two winter hats (especially in June) had me rethinking my “minimalist” strategy. The Original Jones Bag forced me to lighten up, which is exactly what you want when you are walking (especially in the summer). That being said, the three pockets offer a lot more room than what you may think looking at them. One of the ball pockets is exceptionally deep. I had no problem stashing my keys, wallet, cell phone, bag of tees, rangefinder and water bottle in this pocket. The smaller ball pocket has plenty of room for about nine balls and I was easily able to store a sweater, pair of shorts, sunglasses and snacks with room to spare in the long side pocket. One issue I’ve always had with ultra-lightweight carry bags is being able to fit a full set of clubs in them. It seems like several wrestling matches take place every round as I try to put clubs in or take them out. 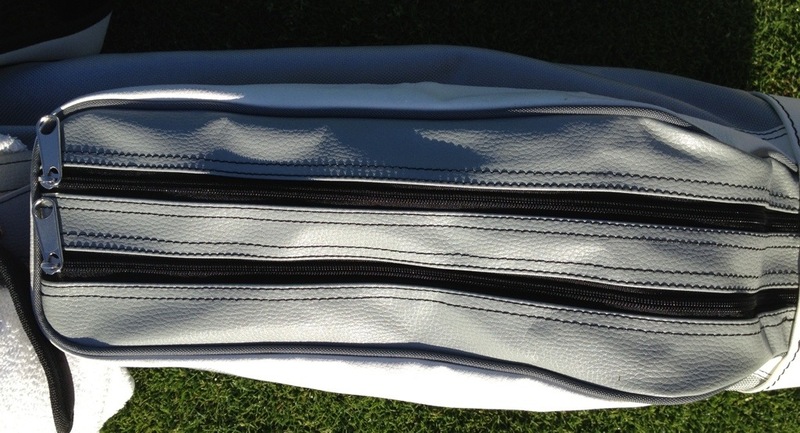 However, the 3-way, 7.75″ top divider on the Original Jones Bags is perfect for 14 clubs. It keeps clubs well organized and offers just enough room for stress-free club selection (even with an oversized Super Stroke putter grip). The new Original Jones bags weigh-in at a svelte 3.5 pounds thanks to a few well-engineered enhancements. The ballistic nylon material is lightweight and water-resistant. As someone who plays early in the morning, I was concerned that my grips and extra clothing in the side pocket would get wet from placing the bag on the ground, but that was not the case. The molded bottom and 3-way top divider is made from a lighter plastic material to minimize weight, and the strap seems to have more padding than the Jones Bags from years ago for extra comfort. So far I’ve played four rounds with the new Original Jones Bag, but it only took three holes to wonder why I didn’t try one earlier. Picking up the single strap and throwing it backwards over my shoulder (see video below) naturally came back to me after 20 years. I have to say, I actually find it easier to pick up the single strap compared to dual-strap stand bags. Plus, the Original Jones Bag is lighter, easier to get in and out of the trunk and doesn’t topple over on side-hill lies. The only modern convenience I’d like to see added is a small pocket for a water bottle. If you enjoy walking, you owe it to yourself to give the Original Jones Bags a try. They are priced at an affordable $129, but do yourself a favor and pony up a few extra bucks for the custom embroidery. And remember, the correct way to carry an Original Jones bag is backwards (see video below).